Skálmöld, the Icelandic folk metal band, have just released their second album, Börn Loka, following the critically acclaimed Baldur of 2010. They’re an interesting band; instead of dressing up in furs and kilts, like a huge margin of the Folk/Viking/Pagan metal scene do, they play in the guise of unassuming, smartly-dressed guys, who just happen to be playing songs about Vikings. They are unique, especially in this particular scene. Well, this album. 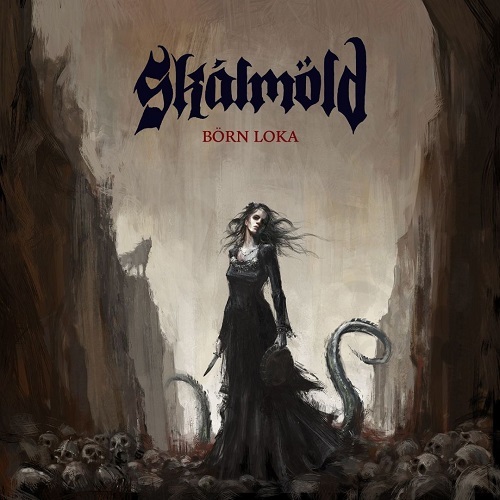 It’s pretty impressive how different Skálmöld manage to sound without actually differing too much from the archetypical Viking Metal sound; they sound somewhat… bigger. The album doesn’t often branch out into the realms of the 9 or 10 minute song (Only the epic closer, Loki, does this), nor does it feature huge orchestration. It does, however, feature 3 guitarists and 4 members who regularly do vocals, with (the fantastically named) Björgvin Sigurðsson being the main vocalist – not to mention a keyboard player, who often uses choir or even Hammond organ (such as on Gleipnir) to boost the sound’s vastness. It’s really immersive without being pretentious, or, indeed, very slow. As for musicianship, the band members are absolutely splendid musicians. It was a joy to listen to these songs, it made think about what was going on, while carrying me through the story of the album effortlessly. A folk melody here, a vast choral passage there, a thrash riff thrown in for good measure… there are many twists and turns on this album, which, instead of making the album inconsistent, seems entirely appropriate. Another thing that the listener should be acutely aware of is the flawless production; the album sounds clean, but also organic, in the sense that there feels like the album has not been meddled with using technical studio wizardry. The mix is good too, nothing feels lacking, nor anything overbearing. Overall, damn good. It’s just a shame that the album came out at the same time as the colossally hyped new Wintersun album (admittedly a fantastic album, but nonetheless), as it is unlikely to get the attention it very much deserves. I’d advocate the listening of this album very highly; Folk Metal done seriously, done without cheese, done (dare I say it) right. This entry was posted on 28th October 2012 at 1:31 pm and is filed under CD, Metal with tags 2012, Born Loka, Folk Metal, Iceland, Metal, Napalm Records, Skálmöld. You can follow any responses to this entry through the RSS 2.0 feed. You can leave a response, or trackback from your own site.